With an ever-growing patient base, and the deluge of military service members reporting this affliction, a tinnitus specialty makes sense. It makes a lot of fiscal sense to add tinnitus treatment to your roster of services. I’ve been saying this for some time now. And with many sensible treatment options available now for the audiologist to consider, treating tinnitus is no longer a shot in the dark. My experience in a variety of industries over the course of my career has taught me several winning strategies for business. One of those is to stand out as a leader in the field. When you have that position, you can dominate the marketplace. One of the best ways to show your expertise is to widen the treatment offerings within your clinic, and develop a real specialty. With a tinnitus specialty, you can offer the patient the depth of your experience and knowledge, and thus present yourself as trustworthy and reliable. Consider this: our society’s aging population is growing. As baby-boomers age, chances are that many of them will experience some deterioration in hearing. It has been reported that more than 80 percent of hearing loss patients experience ringing in the ears. It only makes sense to capture this key patient class and start developing this as part of your practice. Here are some of the reasons you should consider adding a tinnitus specialty to your practice at audiologyonline.com. Be sure to take some time to read it and call us if you’d like any help. How severe is your Tinnitus? 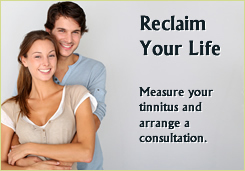 Ready to treat your tinnitus? Want us to help you get started? Copyright © 2017 neuromonics.com All rights reserved.